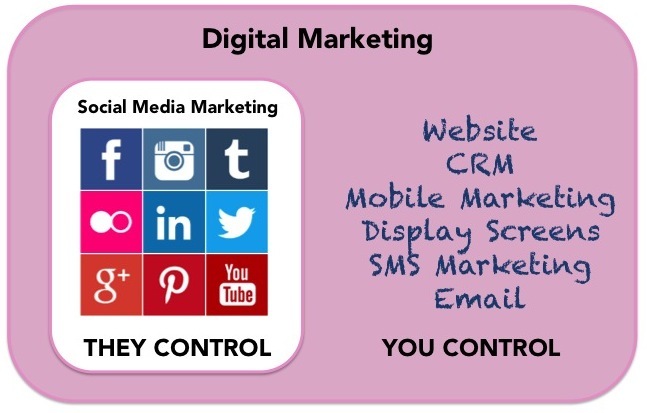 ‘Digital marketing’ and ‘social media marketing’ are the same thing, right? Not quite. And the difference can mean a lot to your business. Social media marketing is a subset of digital marketing, which also includes CRM, website and email marketing, along with things like SMS (text), mobile, display screens and so on. Before we all succumbed to the catnip of social media marketing sometime in the 2000s, many of us were improving business results through CRM, website and email marketing. In the 1990s, I recall stuffing keywords into metadata and seeing the website rank at the top of Altavista. Good times. Of course, we can’t control search engine results to that extent any more (sadly), but we can dictate our website content, CRM system and email messaging. In contrast, the communities, people, format and reach of social media platforms are clearly under the control of those platforms, which in turn are under pressure to ‘monetise’ their media. Social media users expect free access to services, so ‘monetisation’ often means you, the business or marketer. As we are all aware, Facebook is now a ‘pay to play’ platform and it makes sense that others will follow suit. Back in the day, sending interesting, useful information to a well-managed list, backed up by a good quality website, delivered sales, goodwill and brand awareness. This still works. Email and text messages are more direct than social media, reaching people directly on their computers, devices and phones, not just if they happen to be on social media and your content happens to reach them. Of course, there are many ways to personalise social media content and engagement – highly targeted advertising, lists, chats, and so on. But the capacity of the killer ‘website + CRM + email’ combination for delivering warm, customised messages is hard to beat. Everything from past purchases to content viewed to source of contact can be integrated into broader digital marketing activity to develop a strong relationship with your email list. This customisation capacity also allows you to make more precise connections with your contacts. Related articles or product suggestions on websites and tempting, targeted offers on email are examples of this. The potential for social media marketing to boost the profile and engagement of your brand is indisputable: in a recent survey, 92% of marketers indicated that was important for their business (although only 1 in 3 were able to measure its impact). Nonetheless, the broader, battle-tested digital marketing tools are still worthy of our consideration in 2015… and beyond! We see great results from clients doing simple database management, CRM and newsletters. The added ability we offer to integrate campaigns based on sales history also help sending the right message to the target audience. No later than this morning, a client sent an email campaign to a 10k+ mailing list (organically built over 10 years) to promote 4 events. They told me that four hours later, they had 50 bookings, and each confirmation email also includes subtle additional promotional material. Cost: their time to re-phrase their event marketing email, set the events in their CRM ready for people book on-line, and refresh a campaign. As all is handled and fully integrated thanks to their Wandsoft CRM. Since they use it to run their business on a daily basis, the cost is nill, and results are there to prove the efficency. So, even with social media, properly handled digital marketing as you so well describe it, is a great way to get measurable results. Wow, that’s an impressive result and a great example of CRM + email + website adding value to the bottom line of a business. Even better, they can do it again whenever they want – no worrying about algorithms, advertising and the rest!